These are my personal reflections and practices around living a more authentic life. I hope that this will also be helpful for those of you who are on a similar path. 2017 was a year of hurricanes. While Harvey, Irma, and Maria created one of the most catastrophic seasons ever recorded, I felt the same chaotic winds blow right through my personal life. Within the span of a few months, I parted ways with my beloved business partner, and my 7 year romantic relationship came to an amicable but no less painful end. I had come to see these two special people as part of my own identity, and without their anchoring presence, I was suddenly adrift and very much alone. After months of being tossed about in the emotional aftermath, I finally settled into my new place. With my feet on solid ground again, I was surprised to find that I was still in one piece, and maybe even a bit hardier. In fact, I felt eager anticipation about the blank page of life in front of me. I had complete freedom to fill it with whatever I wanted, but what exactly did I want? I created the painting on the left as I visualized my intention for the next year. What surfaced was the desire to live a more authentic life, which meant embracing my unique way of being, living unapologetically by my values, and prioritizing my own wellbeing. To do so, I needed to develop a stronger sense of self - something I struggled with due to my tendency of moulding myself to others. I knew that I had to see and do things differently, and so began my explorations. I asked a lot of hard questions, which led to conversations with many wise friends and mentors, book recommendations, and experiments. Below is the list of practices and resources that have had the most impact on me so far. I am still figuring out what it means to live a more authentic life, but I have already noticed a significant shift in myself - a deeper sense of fulfillment, stronger relationships, and flowering creativity. I hope that this will be a helpful reference to those of you on a similar path. This is intended to be an overview, not an instruction manual, and I plan to update this over time. I may dedicate future posts to describing some practices in more detail, so if there’s a particular one that you’re interested in, let me know. While we’re here, I want to express deep appreciation to all my dear friends who have supported me along this journey (you know who you are!). You inspire and motivate me every single day. I am especially grateful for my friend-mentors for sharing your experiences, wisdom, and kindness: Markus Grupp, Eric Nehrlich, Jason Gaikowski, Wook Kim, Peter Piasecki, Claudia Hepburn, Mom and Dad! Meditating - Not surprising that this one tops my list. Meditation took some time to understand and embrace, but it is now a part of my daily routine. Meditation helps me become aware of the present moment and the state of my mental, emotional, and physical self. This also allows me to practice accepting who I am and where I am in my life journey. I got started with the Headspace 10 day free trial. Since that ended, I have been using Insight Timer, which has hundreds of free guided meditations. What are 3 amazing things that happened yesterday? How could I have made yesterday even better? What are 3 things I’m grateful for today? What is the source of this feeling? Is this signalling something important I need to change? What action can I take to address this? Now I can let go of that feeling. It has served its purpose. Taking a systematic approach to emotions - I have learned that my emotions are just a filter on reality, and that by understanding where emotions come from, I can better control my response to what triggers me. This concept was introduced to me by Hans Krueger at Overlap, and it has had a significant impact on my life. I won’t be able to do it justice here, so you’ll just have to wait for a future post! “Getting the Love You Want” by Harville Hendrix - I highly recommend reading this book, whether you’re single or you already have a partner. It has profoundly shaped how I view personal development and how I approach my relationships. “How to Stop Worrying and Start Living” by Dale Carnegie - A practical guidance on exactly what the title says. “The Power of Now” by Eckhart Tolle - An intro to living in the present moment and letting go of ego. There are parts that get a bit pseudo-sciencey, but there is enough valuable stuff in there to be worth reading. "Collaborating with the Enemy: How to Work With People You Don’t Agree With or Like or Trust ” by Adam Kahane - A highly recommended read that has improved my response to difficult situations. There are so many important lessons in this book, including acknowledging that collaboration isn’t always the preferred response (there is also forcing, adapting, exiting); and that I need to recognize the part I play in any conflict (instead of only putting blame on others). Rewriting my Personal Operating System - A simple yet powerful tool that has helped me take control of my brain and behaviours. Creating Password Affirmations - When you have to type out an affirmation more than 20 times every day, it really sticks. Painting, dancing, and singing - Growing up, I thought that the purpose of creating beautiful things was to impress others. 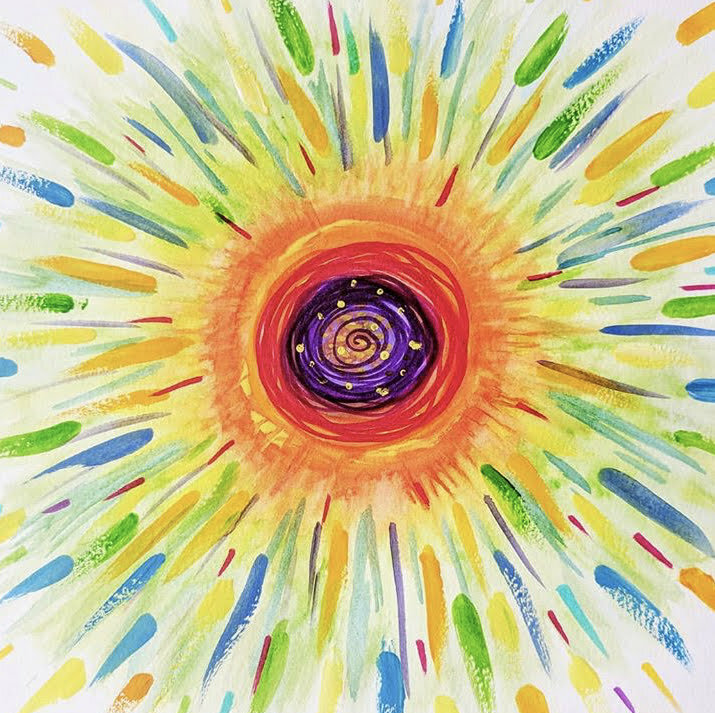 I now pursue creative activities just for myself, and this has been a liberating mindshift. I love the process of exploring my feelings and inner world, experimenting with a limitless palette of colour, movement, and sound. I no longer care what the end result looks like, but I am usually pleasantly surprised. Designing my perfect home - I approached my empty condo as a fun challenge: how might I design my home to induce maximum comfort, happiness, and creativity? I decided that I wanted my home to be a introvert’s retreat and an intimate gathering place for friends (I love hosting). 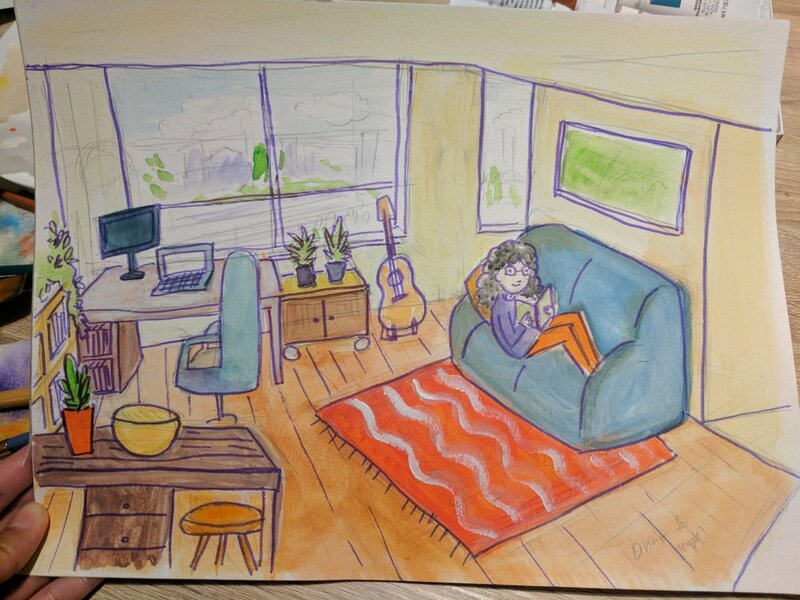 I created many drawings to play around with layouts, furniture, and aesthetics. It took several months, but I am proud to say that I now have a home that matches my unique needs and style - colourful, playful, cozy, multi-functional. A home that I am so glad to come back to every day! ”The Life-Changing Magic of Tidying Up” by Marie Kondo - A recommended read if you’re thinking about improving your living space. I have fully adopted the practice of surrounding myself with things that spark joy, and being okay with letting go of the rest. Loving my body - As I develop greater self-love through the practices mentioned above, I’m finding that I care much less about what people think about me, including my physical looks. I’m proud of my very Asian face, I’ve grown out my curls after a decade of straightening, I’m comfortable wearing no make-up in public, and I don’t feel shy about being naked in an onsen. I’m treating my body much better through regular exercise, eating mindfully, and getting plenty of rest and relaxation. Feeling stronger, healthier, and more confident than ever! Embracing my introvert superpower - I’ve come to better understand and embrace my introversion through learning about MBTI (apparently I’m one of those often misunderstood INFJs), readings like “Quiet” by Susan Cain, and learning from generous mentors. I’ve realized that I connect best with people through one-on-ones and deep conversation, so I’ve stopped forcing myself to go to networking events and large parties. 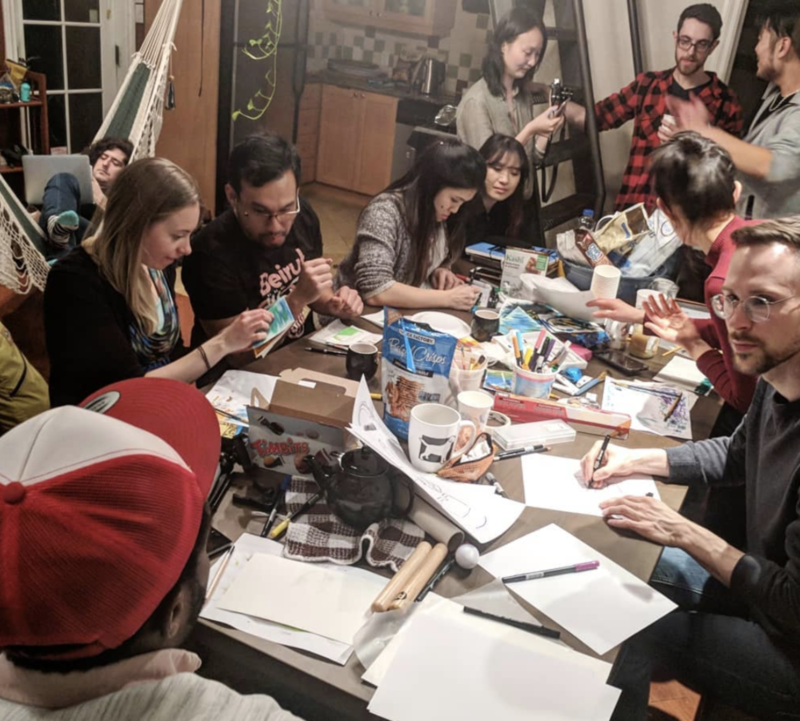 Instead, I enjoy hosting smaller gatherings like artjams and tea chats, where I can help people connect in meaningful ways and share creative experiences. I am also getting better at protecting my much-needed alone time in order to recharge and ground myself. Check out Quiet Revolution and Introvert Dear for resources and community around the power of introverts. I’ve also been looking for more quiet powerful leaders to learn from, such as Ruth Bader Ginsberg, Georgia O’Keefe, and Nelson Mandela. If you know of any other great introvert role models, please share! Saying no and letting go - Being authentic to myself means knowing what’s good for me and what’s not. It means being intentional about what I spend time and energy on. This applies to everything, from activities, to what I buy, to relationships. I have been attending less social events because of my need for solo project time. I have intentionally let go of relationships that were more draining than energizing. I have told friends in need that I’m not able to offer them support because I was going through my own emotional challenges. I have a natural desire to make people happy, so this has been one of the most difficult practices for me. And I know that in putting my needs first, I can ultimately show up better for others. That’s it for now! It feels good to finally have these captured somewhere. Are you also exploring what it means to live more authentically? If so, please share your experiences and practices below. I’d love to hear about them.